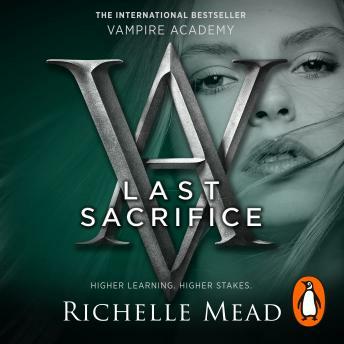 Penguin presents the audiobook edition of Vampire Academy: Last Sacrifice by Richelle Mead, read by Emily Shaffer. MURDER, LOVE, JEALOUSY. AND THE ULTIMATE SACRIFICE. Rose Hathaway is awaiting wrongful execution and there exists only one man who can stall this terrible fate. Rose must look to both Dimitri and Adrian, the two great loves of her life, to find him. With her best friend, Lissa, in a deadly struggle for the royal throne, the girls find themselves forced to rely upon enemies and questioning those they thought they could trust . . .